So here we are faced with the delicious prospect of tasting two of South Africa's most serious red wines. 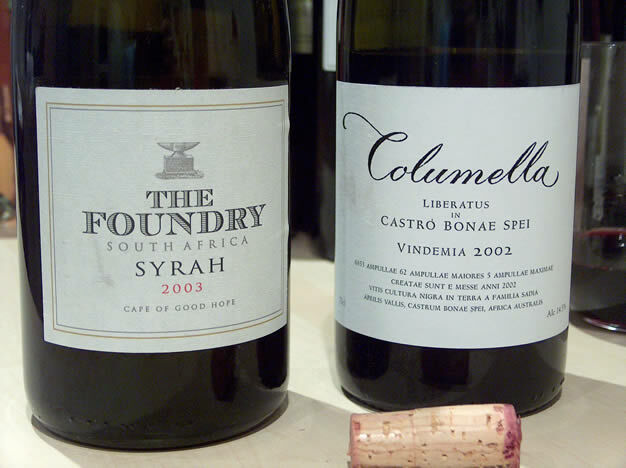 Eben Sadie's Columella is for many the top of the new hierarchy of South African reds, a list which is beginning to be dominated by Syrah-based wines. South Africa's winelands are warm; perhaps better suited to Syrah and Rhône-styled wines than Bordeaux varieties which have traditionally dominated the upper echelons of Cape wine. The Foundry is another hot (not in the thermal sense), relatively new winery that's making a bid for pole position with its no holds barred approach to quality, and their Syrah is very highly regarded. So in a non-competitive but slightly comparative approach, I'm going to taste these two wines together. First, some context. It's 10.30 pm (a little late, I guess), but I've just been playing football. As it's usually best to play football in an utterly sober state, this is the first chance I've got of trying these wines. But am I mad? Opening two wines both of which have the capacity to be the focus of two immensely enjoyable evenings, at 10.30 pm? Well, truth is I came by these bottles earlier this evening when they were already in an open state. I was one of the late arrivals at the Wines of South Africa tasting of a range of 30-odd high end wines, and as I was the last to finish tasting Sophie asked me if I wanted to take any wines back. I could only carry two, so I chose these. They were my favourites (along with Klein Constantia's stunning Vin de Constance and a delicious Vintage Port-style wine from Axe Hill), so I bagged them. Each bottle has just under two-thirds left, so they really have to be drunk tonight, or at a pinch, tomorrow. The ambient temperature is quite high: a sticky 25 °C. This certainly influences perception, but I'm trying my best to bear this in mind. The structure of red wines changes considerably with temperature. I'm drinking out of a Riedel 'O' series Cabernet Merlot glass. My tentative conclusion is that these are two of the best red wines I've tasted from South Africa. It's encouraging to see the progress that is being made here at the top end. It will be fascinating to see how these wines evolve.